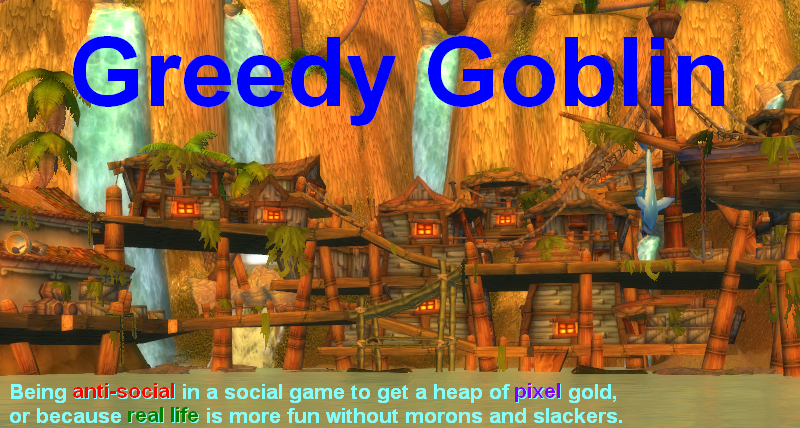 Greedy goblin: Who will quit first? Another directly WoW-related post here! I'm still making gold, just the niches to find are less and less and I hate repeating myself. Search among old posts! However this topic has not been covered, although essential both in economy. While it's very important in RL it's a bit dumped by the existence of employees. In WoW on the other hand it's crystal clear. The same problem emerged for Stokpile and a newly joined person to the ganker guild. Stokpile was selling glyphs for 8G max price, all purchased by "mister blue", obviously for resale. He shown up on his blog claiming he will drive the price down and drive Stokpile away. The new guild member told he is a scribe, but he wants another profession since I'm also a scribe so he has no chance. That's completely wrong. If a rich and a poor competes for a market and they have similar costs, the poor will win. The reason is simply different valuation of time. Crafting a glyph takes about 10 secs if we add the relog, scan, buy, mill, craft, post, postbox times. If there is serious competition, many of the glyphs will return. The gold/hour will be profit * sold_glyph / all_glyph * 3600/10. If I have 10% sell ratio and 10G profit, then I'm having 360G/hour, barely above daily income. If I have 50% sell ratio and 20G profit, I'm having 3600G/hour. Big difference. Competition will decrease sell ratio and decrease profit too. So the G/hour will drop to all competitors. Who will leave? The "common sense" says the poor gives up since he must make profit, while the rich can exist with no profit, living on savings. However the point of making money is having money. So if I'm not making money, what's the point? While the rich can keep the prices down, stopping everyone from making money, why would he do it? Common sense says "to keep the market for himself", but it's wrong. If he defeated all competition, and rise the prices up, new competition will instantly arrive. In the real world, this can be delayed by entry costs, but not in the perfectly fair world of WoW. The truth is that on the long run, the one who is ready to work for less G/hour will win. And this is usually the poor. The only exception is when the rich is fighting not for gold but prestige "this is my market" what is really stupid, and usually breaks after a couple of weeks of working hard for nothing. For a poor, 350G/hour is exactly 50G more than dailies. For me, it's a couple weeks off from making money. Until I'm forced to, I won't work for 350G/hour! So our new guild member could easily drive me away by setting up QA3 for 5G max price. While I could sell glyphs for less, I don't want to. In the real world there is one more factor: employees. The rich company can work for spare change (multiplied by huge quantity) because the work is done by employees and not the owner. However it does not falsify my statement, it proves it. The reason why the company can do it, is having poor employees, who are ready to do the actual work for less $/hour than the small business owner. Without such poor people, the big and rich company could not even exist! The ability to have a successful glyph 'business' on Magtheridon comes down to the availability to get 'cheap' (or any) raw materials (herbs). Being able to sell quantities of herbs is good but these have to be restocked. Problem. Yes yes I know neutral ah transfer. Or even .... farming. Farming is problematic due to the pvp server, however the horde side bots can do all the farming needed. The real difference in wow and RL here is not the entry barriers, but the reentry barriers. In life having all the stuff needed to mass produce an item lying around not only doesn't make you money (this is the case on wow) but also costs you money (rent/mortgage/property taxes/salaries/etc). In RL a business can't just take a break because the competition is selling below cost, in wow if you want to keep all the glyphs below cost have fun and I'll re-enter the market when prices rise again. The last and biggest, in my opinion, difference is the ease if diversifying. It takes a lot more capital to start a textile manufacturing company than it does to roll a dk, level to 65 and cap tailoring to sell bags (even on as bad a server/faction as that on). There is a huge difference between WoW and real economy. You can change your price within seconds by posting again at a different price and everyone can compare all prices with a press of a single button. All you have to do is post your glyphs for 1 Copper less than Gevlon whenever he loggs off and he won't sell a single glyph. The person who is willing to camp the AH will always win the market. Of course, it's also a huge waste of time but the advantage is that you (the camper) get a better price. That's what happens with gems on most servers, at least it happend on mine. I've been waiting for a post like this. Many of your old posts on the subject gloss over competition and tend to spend more time focusing on the fact that you had none. The popularity of your blog, however, meant that for most people who tried selling glyphs, they ran into a determined goblin who was willing to reduce their hourly income to whatever needed to get glyph business. For what it's worth, I will comment on the glyph market on my server. Trying to sell glyphs with current competition levels is nothing but a complete waste of time. Within an hour, you will be undercut 5 times on every glyph you post. If you post 500 glyphs, you will be lucky to sell 5 for 10-15g, and then you are undercut and the rest will come back to you. Herbs are very cheap, probably due to mass botting, but I haven't seen it with my own eyes much, but it must be the case, as you will see 20+ stacks from same person with funny name (all consonants). The gem business is quite good though. I think the high cost and unpredictable supply of raw materials, combined with high deposit cost, keeps the goldfarmers away. Also, there is a high powerleveling cost (5-10k on my server), so there is some barrier to entry. I understand on other servers gems are quite more cutthroat, but here, at least Tue-Thu, 50% profits on gems are quite common. I know it's very unGevlon-like, but I just QA3 every glyph down to around 4 gold (skipping, not falling back) every weekday. It takes about 15 mins to stock herbs, empty the mailboxes & post on the three glyph toons. I make around 1200 gold revenue a day on average. About once a week I mill herbs, and produce inks for an hour or so, and once every couple weeks I restock glyphs for maybe 90 mins. I spend ~1500 gold/week on herbs. I put no thought or intelligence into this. I use it just to maintain a basic income as I've become lazy in recent months. This comes to about 1500 gold/hour *profit*, primarily afk time (including purchasing herbs, milling, glyph manufacturing, posting & mail retrieval time). Since I feel this is fairly optimized, when I have time I prefer to put my actual efforts into more lucrative endeavors (continuing my enchanting scrolls mainly, also breaking into selling bags a bit). I've stopped selling gems as of late, though it's always in my back pocket. "However the point of making money is having money." What is the point of having money? I can't recall any major gold sink activities that you enjoy, at least none recently. Do you have a use for the gold or would a more accurate statement have been "For me the point of making money is the challenge"? @Eaten by a Grue: On my server there's not so much gold in mass glyphs, but some to be found from getting to empty markets first. The goblins get bored or distracted and other people just aren't searching, so now and then there will be markets which have either no one selling or selling for something absurd like 75g, so a few glyphs scattered around will bring in a good profit. The only problem is that it can be time-consuming to find these markets, and slightly frustrating, so you might be better off in other areas. I can verify that the gem markets are 'friendlier' to a steady, low-risk income that doesn't require fighting a few dozen reposting campers. My server isn't so generous to give 50% most of the time, but any day there is around 20%, sometimes higher. I think the high deposit does scare off a lot of people. Gevlon said: The truth is that on the long run, the one who is ready to work for less G/hour will win. And this is usually the poor. The presumtion that the "poor" somehow have more time to spend on this then the "rich" is flawed. What amount of time you wish/choose/can spend in game making gold is not related to your current amount of gold. In fact, quite a few rich players will indeed stick with lower gold/hour to keep the market, because playing the market is part of the game experience they enjoy. If you replace "poor" with "have lots of time and really want to get gold" and "rich" with "will only bother if the gold/hour ratio is good" then your post will be correct. As usual, your compulsion to prescribe everyone with a set of rationales based on your values undermines an otherwise good idea. I think you've overlooked something here in your analysis of the situation. I think your right that the important factor is how the individual values their time. But an important factor also here is the efficiency with which an individual handles the process. A veteran is going to have an enormous leg up in the fine tuning of all the related mods and will likely spend much less time doing the same tasks. Then you have people who are extremely serious about making gold easily whom pay for a second account and run it on a second computer while they play. Thus enabling them to camp the Ah without sacrificing their actual play time. To these people their valuation of time will be different and that valuation will determine when someone considers a market a loss. Its much more likely that someone with a second account will grind out low profits to drive off competition because they are comfortable with their setup and it would mean more time for them to change niche's and professions. On my server I camp the AH all day every day and so far I haven't noticed a decrease in competition. I don't really mind, since it's as Gevlon says: If I was the only one the prices would be so high that new competition would come. I have a second account and multiple computers, so I QA auctions while playing on the other account...but before I had the 2nd account, I would QA auctions while cooking/eating/reading. In either case, I would figure gold/hr by only counting the time I actually spent at the computer initiating QA/queueing glyph production/milling. So, I don't think the 2nd account makes that big of a difference in time efficiency, although it makes a big difference if I want to accomplish different things in a limited window of time. @KristineAsk "The presumtion[sic] that the "poor" somehow have more time to spend on this then the "rich" is flawed." Willing to work for less gold/hr =/= somehow has more time to spend. Therefore, the only false presumption is made by you. The main assumption Gevlon is making is that rich players usually have better alternative gold making strategies than poor players would, the second assumption is that rich players often assume that dips in profit potential are sometimes temporary and they can afford and do choose to wait until the dip is over for each different market niche. Those seem like reasonable assumptions to me. "In fact, quite a few rich players will indeed stick with lower gold/hour to keep the market, because playing the market is part of the game experience they enjoy." This is a completely different tack, totally unrelated to the time comparison you made immediately previous. this sounds pretty reasonable, but if you actually do the math, this requires selling glyphs at like 4g(depending on herb price and sell ratio), or selling other commodities at similarly low margins. I've played the glyph market on many different servers and I've never found someone willing to sell at that low of a profit margin for any long period of time...so although what you are saying sounds reasonable at first, I'm not really buying it. @Klepto ""However the point of making money is having money." What is the point of having money? I can't recall any major gold sink activities that you enjoy, at least none recently. Do you have a use for the gold or would a more accurate statement have been "For me the point of making money is the challenge"?" Do you just read random sentences in isolation? If you'd quoted the next sentence as well: "However the point of making money is having money. So if I'm not making money, what's the point? ", then your questions are completely irrelevant. "The only problem is that it can be time-consuming to find these markets, and slightly frustrating, so you might be better off in other areas." #1 Most people call the glyph market one market, not a collection of markets. #2 Addons post glyphs quickly and automatically, no time consuming search required. It is mind boggling that you do not know this, given your history criticizing 'goblinism' one would expect at least a basic level of knowledge about the methods of those you so frequently mock. Kurt, are you even trying? The richer player also has more options for buying up his competitor's supply of herbs. All of the theorycrafting in the world won't save the competition if they can't get enough ink to make his glyphs. Driving up the cost of herbs in the AH can even convince farmers to cancel their COD contracts with the competition, crippling them if they don't have a reserve stockpile. The richer player can also expand into other niches to attack his competitor's other sources of income. When someone was being too aggressive with their glyphs postings, I went after their other items, whether it's Eternal Belt Buckles, flasks, common gems, metadiamonds, whatever. The rich player can throw enough gold around to become a major player in all of these secondary markets, robbing the poorer player of the income he needs to compete in any of them. I'll vouch for Gev's theory, I've triple capped and there's no point selling low profit items. Glyph selling to me is a mindless game and it's filled with people that have no other real ways to make gold. I make several thousand a day doing other things, but I know the glyph sellers so I only post once a day, every glyph, 5 copies, 2g above cost minimum, 24 hour duration. I watch with glee as people undercut me. I do this just for entertainment value and the funny thing is I only sell like 10 a day. Yep, I get almost all of them back. So yeah, the poor guy is probably farming the stuff up themselves or barely making any g/hr on my server, because any reasonable person would quit. It's also a question of need vs. want and the confusion between the two. Arrogance makes people think that they NEED this market or else they're not the super cool uber powerful king of the AH. Me, having such little gold spent on my alliance side project, I don't NEED a huge amount of income. However not having a ton of gold I do need some form of an income that isn't dailys. I think that 1k gold+ per craft/post session is quite good. If the poor is REALLY poor, his psychology will feel miserable while the rich guy will feel "content" with whatever riches he has. To me, the poor guy will give up and quit, depressed as he will be, and settle for Valium or whatever. The term you want is http://en.wikipedia.org/wiki/Marginal_utility Not only is 100g worth less to someone with 200k vs 2, what you can incrementally buy is worth less as well. This is Mr Blue..as you will..a grandma of 10.I never ever said I would run out anyone from glyph making..I said I would not be run out..quite a difference.I do not buy the glyphs to resell/// the price gets so low it costs more to make then sell///I buy the glyphs..all of them...raise the price to 44-54g list 3..one to 3 hours later post again if I have been underbid.I actually encourage competition.The glyph business is hard..the best thing to do is post a few..3 or less of the same type..never more cause there r other players trying to sell.Always remember if you sell 1 for 40g you still have the mats to make the next one. I admit going overboard and posting 50 of each and every glyphs this last weekend but it really angered me to buy 10 at 8g post at 44g..check it before logging and there be 10 more for 8g not to mention finding his blog in which he has ridiculed me.I use to spend 60% of what I made each day buying the lower priced glyphs on to post for a higher price yes...but I am no fool.The daily earnings use to be above 3000g..would buy 1800g worth of glyphs and pocket 1200.Or I would buy herbs and ink..I have no gatherer. The person who claims to be a victim keeps posting 10 glyphs at 3.5g..it costs me 3.75g to make.The real reason I posted so many over the weekend is that I was going to be away from home and was so angry I refused to allow stokpile to control the market which is his ultimate goal according to his blog. The true key to the ah is to NOT sell when the market is low..let others lose their money and materials..but keep in mind that not all glyphs sell..two of my blues have nothing but unsaleables (tricks the new comer into making things that dont sell).